“Overlord” covered the whole operation of invasion, “Neptune” it’s Naval phase. From now on many people laboured day and night for fourteen months, they overcame immense difficulties; no problem was too great, no consideration too small. Then, in the first week of June 1944, they put the result of their long and arduous labours to the test. By June 4th, the weather was so bad that the invasion had to be delayed for one day. On the 5th, though conditions were still terrible, there was some slight hope of improvement. Appalled by the chaos which would ensure if there was more delay, Eisenhower decided that the risk must be taken: D-Day would be June 6th. Everyone can picture the scenes on D-Day. The landing craft gliding quietly towards the shore, then dropping their ramps with a crash. The white (or green, depending on their level of sea-sickness) faced men inside, sitting crushed next to their comrades in deadly silence until an order is given at a shout, then running and running for the beach. Past men screaming for help, being dragged underwater by their gear, or lying face down in ever-spreading red pools, having been blown out of the sea by mines. Past those sinking shakily to their knees on the beaches, and the piles of bodies spread out like waves along the sand, with explosions sounding all around; knowing all the while that, at best, what awaits on the other side of the dunes is a foreign land, filled to the brim with a mighty and deadly enemy. No wonder these brave men and their actions have remained firmly embedded in the public consciousness ever since. The D-Day invasion, also known as ‘Operation Neptune’, was not a small operation, nor one that was entered into lightly. It involved no less than 156,000 Allied landed troops, 7,000 ships and landing craft along with 195,700 naval personnel, 50,000 vehicles, 11,000 aircraft and 23,000 paratroopers, all working together to attack 58 miles of coastline. Norman Longmate explains in his ‘If Britain had Fallen’ that Hitler’s intended invasion of Britain in 1940 failed largely because he only began to seriously plan the attack two days before his speech to the Reichstag in mid-July. Having swept through Europe more rapidly than he could ever have imagined, Hitler plainly expected to be able to mount a similar invasion extremely quickly, since the bad weather would make it unfeasible to invade from mid- September onwards. Conversely, Britain’s best generals spent two years planning their D-Day amphibious invasion, crafting and perfecting the arrangements – and it showed. The casualties of the day were heavy, but on D-Day, the Allied army became the first invading force to successfully cross the Channel since 1688. It was clear to both sides that this was the decisive operation of the war. If landings succeeded, Germany must eventually be crushed sooner or later between advancing forces of Russians and the Allies. Should the landings fail, the Allies might well take years to recover from their losses in men, material and morale; the people of Occupied Europe would give up hope and Germany would be left free to turn and square the account with the Russians. ‘Neptune’ – the cross-Channel assault-phase of Overlord – would put a tremendous strain on the Navy’s capacity for organisation and supply. The invasion fleet consisted of about 7,000 vessels of all kinds, and this posed massive staff and administrative problems – build-up control, turn-around control, repair control, tug control – all the while carrying out the vital anti-submarine patrols. First, minesweepers would clear the way for the huge phalanx of transports; then a force of 138 warships would bombard the German beach defences while destroyers, sloops, frigates, corvettes, and trawlers escorted the convoys as they streamed from the south coast of England. There was a total landing-craft strength of over 4,000-of which about half travelled under their own power. And, in addition to all this, there was the task of shunting 146 Mulberry units across the Channel, all to a strict timetable – the job of over 3,000 tugs, small craft, and barges. Overlord began with the paratrooper drops: in the west to isolate the Cotentin peninsula by holding the Merderet Douve line, in the east, to shield the left flank holding the line of Orne. Despite scattered landings, both objectives were achieved: widely dispersed US paratroops prevented coherent German attacks on the Omaha sector, while the British destroyed the Orne bridges and pinned down the German armoured reserves in the Ranville area. Opposition to the landings varied considerably. On Utah Beach, the troops went ashore at 0630 hours with negligible losses and were off the beaches by 1200 hours. On Omaha, lack of specialised armour allowed very strong defences to hold the troops on the beach and slaughter them. By midnight the deepest penetration was hardly a mile. In the central sector, specialised armour brought the British and Canadians swiftly over Gold and Juno Beach and by the afternoon they were probing inland towards Bayeux and Caen. The Sword assault was equally rapid: by 1400 hours leading troops had reached Bieville and the Commandos were linking up with the paratroops. The 23,250 US Army troops aiming for Utah beach met with early misfortune, as the boat responsible for guiding them to shore, patrol craft PC-1176, hit a mine. They made their way to land, nonetheless, just over a mile south of their intended landing place. The mistake served them well, as the beach turned out to be largely unguarded. 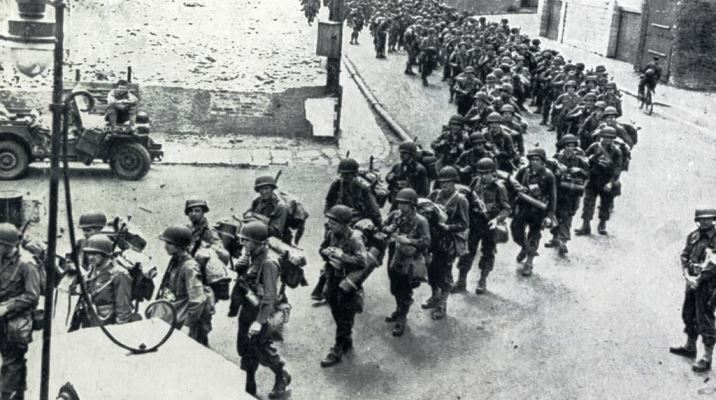 Quickly the men fought their way inland, with just 589 losses according to the D-Day Museum website. The stereotypical blood-stained picture of D-Day most strongly reflects what happened on Omaha beach – that is, mass slaughter. 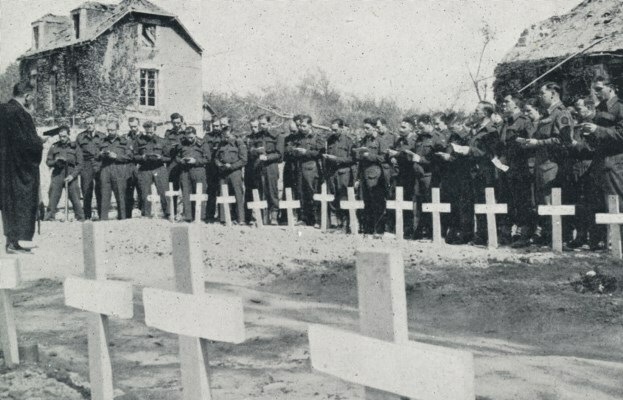 Not only were the defences very strong, and largely untouched by the bombing, but the defenders were of the 352nd Infantry Division, tough veterans from the Eastern Front; Allied Command had not known that this unit was present. The bullets were flying before the landing craft even made it to the beaches. Unfortunately, a huge proportion of the available DD tanks – 21 out of 29 – were swamped getting to shore, and more were knocked out immediately on landing. 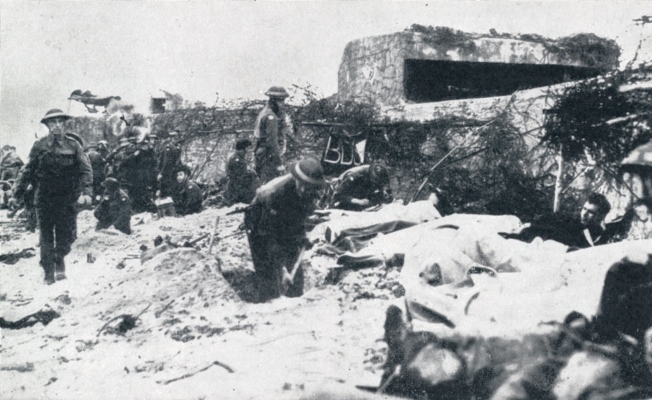 Many troops found themselves trapped on the beaches by the anti-tank walls, with nothing but their personal weapons to help them break through. They were also left at the mercy of the mines which either the DD or AVRE tanks might have been used to clear. Ironically, they met with far less resistance beyond the beachhead, so had they broken through faster they would have suffered relatively few casualties in the landing. 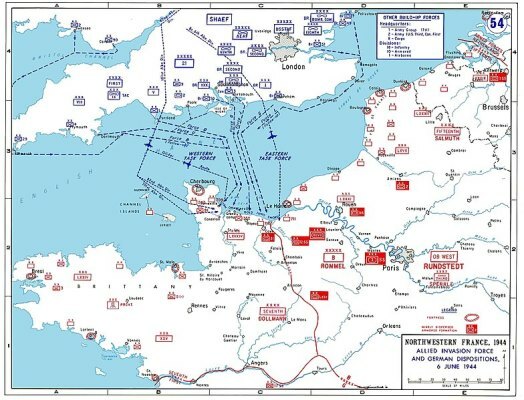 As it was over 10% of the 34,250 US troops who landed on Omaha beach lost their lives on the first day of fighting, and the assault was almost called off before the navy ships (at great risk) moved in closer to help bombard the beach. Similar heavy resistance greeted the UK troops on Gold beach – 1,023 men died - but with two key differences. First, according to ‘The World at Arms’, the naval bombardment began 20 minutes earlier than on the US beaches and lasted nearly an hour longer, plus frogmen were sent in to help clear obstacles. One landing craft exploded nonetheless. On Juno beach, there were initially heavy casualties, as landing craft and vehicles were hit, but again the ‘Funnies’ did their bit and cleared mines and blasted holes in the sea wall. Add to that the fact that the terrain was much less favourable to the defenders that on Omaha beach, with no cliffs and lots of routes inland, and again, far fewer men were killed, though 1,242 Canadian soldiers still died. The best progress was made from this beach, and by nightfall, the troops were nearing the town of Caen. Sword beach was initially quite lightly defended, thanks to the British paras’ success in knocking out Merville battery, which overlooked it. By 1.30 the commandoes under Lord Lovat had met up with the paratroops, and things were looking good. A late attack by the 21st Panzer Division slowed their advance considerably, but after two assaults the tanks withdrew to Caen. The men were just lucky that confusion over orders had delayed the tanks’ approach until the afternoon; nonetheless, 1,304 troops died.